Shai Coggins over at b5 Media had the fantastic suggestion to do a blog giveaway on our sites. I’m not a b5 member, but I have done some giveaways at my other blog and really enjoyed the feedback and participation from readers. I hadn’t thought about doing one for this site, but why not? Writers love getting free stuff! Well, this writer does, anyway. So herewith, my first Interior Designs giveaway: your very own copy of Robert Bly’s new book, Getting Started as a Freelance Writer (Expanded Edition). A lot of you probably are already familiar with Bob Bly, he of the high-six-figure-income copywriting fame. This n ew Expanded & Revised version just hit bookstore shelves a couple of months ago, and already I’ve devoured it and its hard-hitting, practical advice on making a more-than-decent living as a freelancer. Bly offers tons of tips on everything from marketing and productivity to writing poetry. (I know. Bly writing about selling poetry? Wow.) He doesn’t really delve much into blogs, though, other than a three-page section titled, Do You Need a Blog? 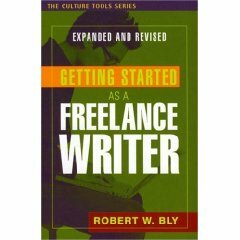 Still, anyone who makes a living writing — on- or offline — can benefit tremendously from Bly’s advice on how to be a more productive and high-earning writer. The rules? Very simple. Just leave a comment below about your favorite writing book. It can be this one, or maybe Jenna Glatzer’s Make a Real Living as a Freelance Writer, Naomi Wolf’s The Treehouse, or even Little Women (I think Jo March was my first writer-heroine). Don’t just tell me the name of the book, though; make sure you tell us why you love it so! I’m always on the lookout for good reading material, so this is my excuse to troll for new ones. At the risk of sounding redundant, let me reiterate: Comments must include both the name of the book and the reason why you like it in order to qualify. The giveaway is good for two weeks, so make sure you get your comments in before the deadline at 5pm Mountain, Tuesday, July the 22nd. And don’t forget to check back here on the 23rd for the winner! Strunk & White's Elements of Style was my start and I go back to it often. Keys For Writers by Ann Raimes. It was the first book to help show me that I can do it. The Elements of Style is my favorite.